Physical arrangement in improv is when you use space as structure for improv. This is an example of physical arrangement. One of our first exercises had us all in a circle. Our teacher, Lisa, tossed us an invisible, red ball. She held the ball in her hands. While the ball was invisible, the ball was real. We treated the invisible ball as if it was a real red ball. We tossed the ball around the circle. Key observation: we could NOT say no to the ball. Lisa created the reality that there was a red ball. Therefore, we honored the space Lisa created by tossing this very real, very invisible ball around our circle. My favorite exercise was physical mirroring. This is when you have a partner and you mirror each other's physical movements. I stood facing my partner and moved my right arm up and in a circle. She moved her right arm up and in a circle--mirroring my exact movement. I loved this exercise because it was slow and our movements were simple. Empathy seems to drive the slowly, simple movements. My partner wanted me to be able to follow her movements. In order for me to follow she had to go slow. She had a sense of what I was going through as a follower and what it took to merge movements. We built off this exercise by both moving as the same time--taking turns leading and following each other's movements. While we took turns leading and following each other, there was this mysterious merger we had with each other. The boundaries between who was leading and who was following were clear and blurred all at the same time. Empathy and improv are connected. This connection seems to break through the binary of right and wrong. 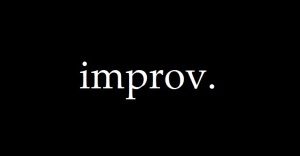 In improv, there is not right or wrong. There is only risk. There only "is." Examining right and wrong is crucial when it comes to liturgy and the experience of liturgy. In theory, the Church can embrace the truth that as humans we are a mess, we are fallible, we aren't perfect. Jesus embraced imperfect people. Therefore I/we will, too! Except we don't have too because I/we are always right. Embracing the reality of imperfection seems to get blown out the sanctuary door when imperfection (our humanness) is part of the liturgy. Sermon must be consistently right. Your kid(s) are making noise in worship which must mean you aren't right in your parenting. This liturgy is making me uncomfortable which means there must be something wrong with me and/or these worship leaders are just wrong. When our internal landscape of rightness rears its non-empathetic head....when we cling like hell to our rightness, we literally create our own reality on top of the reality we want to reject and ignore. The consequence--we miss out on the invitation to share in Jesus-like-empathy. We miss out on being human together. Someone stops singing because tears are coming down their cheeks. A parent struggles to parent their child(ren) in worship and feels helpless and lonely. Preacher give crappy sermon because they are preoccupied with a family matter. Improv and empathy. It's real. And it's not just for the theater or the Church. It's for everything. This mirror exercise is lifted up in a Science Friday podcast with Alan Alda, the actor, who started the Alan Alda Center for Communicating Sciences at New York's Stony Brook University. This center trains doctors and scientists in improv in order to become better communicators by accessing empathy. An example was given of a doctor, who had been trained in improv at the Center, was giving a patient the news she had 6 weeks or so left to live. The mirroring exercises that the doctor had participated in allowed the doctor to sit, listen, feel, and notice the patient as the doctor delivered the news. Mirroring allowed the doctor to access empathy, and in turn, be present with the patient in her own grief, confusion, and questions.